Articles about the bike rescue weather it be in Albany or Troy. and Collard City Growers, is a bicycle compost delivery project employing neighborhood youth. It diverts household and restaurant food and yard waste back into the ground on our urban farm all by way of the transportation of the future: The bicycle! Food Cycle will create a hyper-local compost network that lays the groundwork for a self-sustaining, scalable enterprise. We need the help of financial backers for initial investment. Who we are: Collard City Growers is a grassroots demonstration garden and composting project located in North Central Troy. We turned a vacant lot located in a brown fields-designated area into an urban garden, drawing upon resources from the community and the Upstate New York region to grow produce and the next generation of growers. 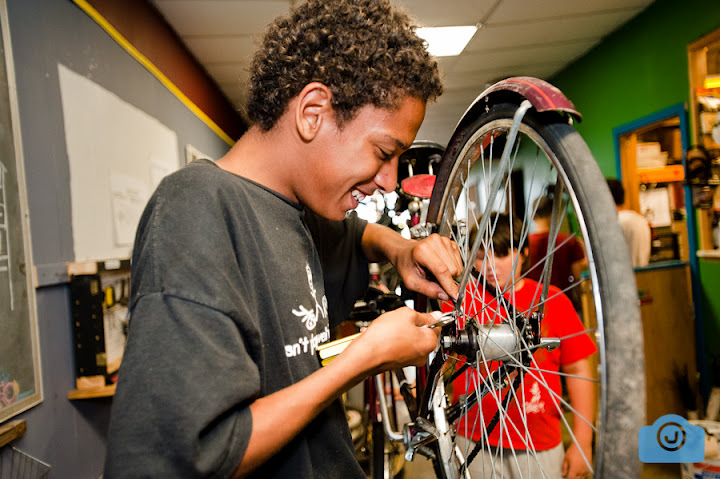 We help to build bicycle community in the capital region through hands-on education. A little over a year ago I was inept at fixing bikes. I couldn’t even clean a chain. Who would have guessed that last weekend I and my colleague and fellow ABR member Mike Barr would be teaching people how to repair bikes in representation of ABR at the Madison Ave. Street Festival. ABC was there as well with a swanky new sign made by Lorenz Worden with our new logo on the front. After the initial set up Ken went on a coffee run to give us that brown liquid that makes us warm in our bellies in trade for bike repair because his headset had some play in it and his handlebars were loose. Sadly we could not fix his bars, but we removed the play on the stem. Next was a child who needed his training wheels readjusted. Easy enough. Lastly there were the bike cops that wanted to swap seats and seat posts. I am always glad to help out the boys in blue. 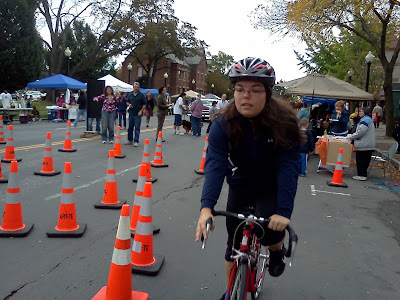 On the other side of things the APD set up an obstacle course that was supposed to teach you bike skills and was designed for kids bike, but we had to try it anyway. After all of us almost wiped out we all managed to get through big bikes and all. We then tore down the obstacle course and turned it into a bike polo rink. Of which two out of four people wiped out on and it was taken down soon after. All in all it was a good day for Pine Hills. With the ABC, ABR, and the APD representing in the way of bike advocacy, repair, and safety it was a good day to be a bicyclist. Also I discovered something interesting. Pine hills has a Google Calendar with all there events on it. So if you use Google Calendar like me you can add it to yours and get all the events that are happening each week, and there is a surprising amount of events up. So go check it out. 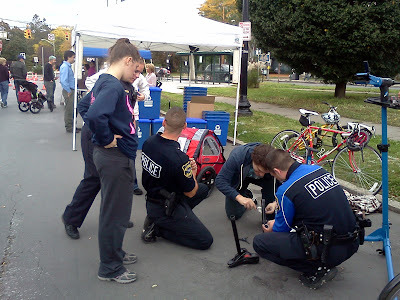 What’s happening at the Albany Bike Rescue? What’s that? 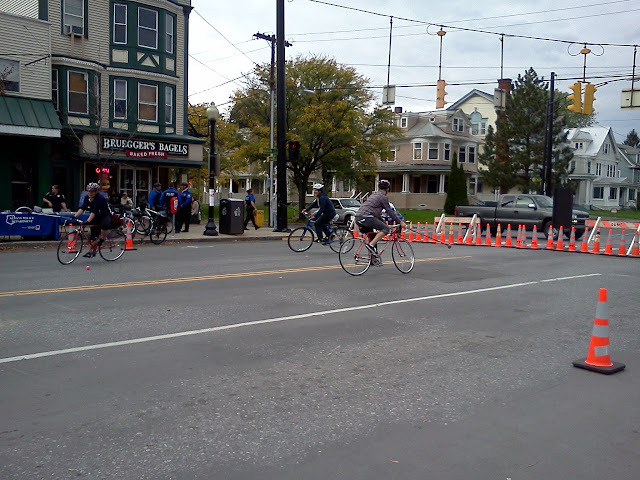 You want to know about the Albany Bike Rescue (ABR)? Let me see if I can dig something up. A big thank you to DownTube and Dan for providing us with used bicycle parts. Chris and Mary Lou collected the items Saturday and delivered it to our parts room at Trinity. 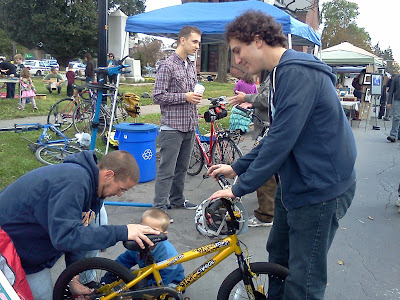 They managed to part out the bikes, sort the small items, and repair some gently used tubes. They also quickly fixed up two pink girls bikes (20 in and 16 inch) and put them outside with a free sign. This made room for the Bridgestone 100 that Dan donated to Albany Bike Rescue for someone to build up. For those of you who tirelessly volunteer with little time to work on your own bike projects- We need to figure out a way to make this a more equitable situation. 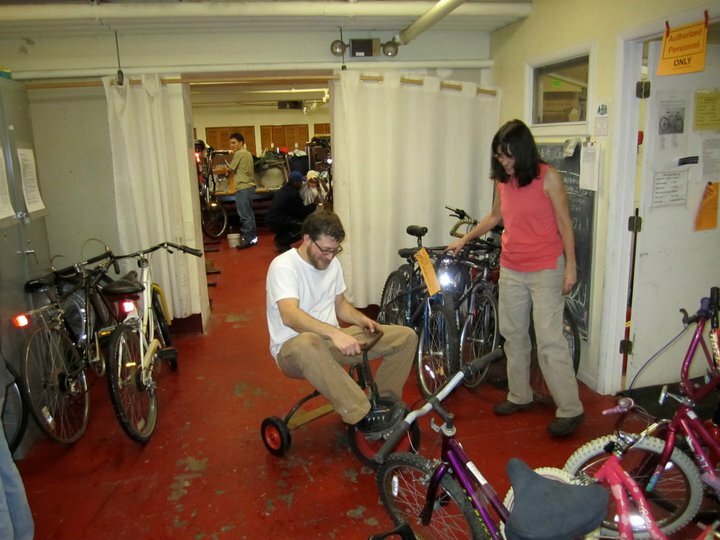 We have been researching other bike rescue models to find ideas on how to manage the number of people wanting bike repair vs. our limited volunteer resources.